You've found the “U.S. Call Duck Breeders” page here at Hobby Farm Wisdom! If this is the first time you have visited our site: Welcome! 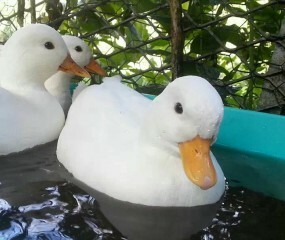 The Call Duck is the smallest bantam breed of domestic duck; the drake weighs 1-1.5lbs and the duck 1–1.25 lb lbs. Its head is relatively large and round with and large eyes. Their bill is short and broad with a maximum length of 3.1 cm. It has a short thick neck and short legs. They are raised mostly for decoration or as pets. Females lay between 50-150 white eggs and they mainly are white in color. They need shallow containers due to their size and need to be kept secure from predators. The Call ducks were developed for their distinctive high-pitched call and have been used as decoys to catch wild mallards. Their name comes from the Dutch word 'de kooi' which means ‘trap or cage'. The first recorded mentions of the breed are from the Netherlands. Call ducks, despite their size are one of the noisiest ducks.